We're kicking off the week, by celebrating today's UK release of the The Man from U.N.C.L.E. on Blu-ray/DVD/Digital HD. And we have some exclusive clips to share with you, courtesy of Warner Brothers. Here are some of our favorite ones, you can watch the rest on our playlist. Henry Cavill and Armie Hammer are two of the biggest rising stars in Hollywood, both known for playing action heroes and performing daring deeds with some risky stunts. But now it’s time to find out who is the most daring dude of all. In support of the home entertainment release of The Man From U.N.C.L.E. which is available on Digital HD, Blu-ray™ and DVD today, we pit the two stars against each other in their most well known (and not so well known) roles for this ultimate hero-off. Superman has his own super-human powers and can deflect bullets, he also has super human strength. He can throw cars around like they’re confetti! The actor worked hard to bulk out for the role so Henry gets super points for sheer dedication alone. They equal each other in their ambitions for good and doing what’s right, using their skills only in defense, so that’s plus points on both sides. And, although The Lone Ranger may be a hero, he needs weapons and help unlike Superman who is practically a weapon himself, he is known as the ‘Man of Steel.’ Ultimately, Superman aka Henry Cavill has to win. He is Superman after all! In Immortals Henry plays Theseus, a demigod, son of Aethra by two fathers: Aegeus and Poseidon (God of the Sea). Things must get #awkward at family gatherings. The 6ft tall demigod knows how to yield a sword too. Armie Hammer plays the Winklevoss twins in The Social Network. The characters are incredibly intelligent and arguably have super human intelligence, attending one of the most prestigious universities in the world. But, demigod vs two humans? Sorry Armie, a demigod beats any number of humans even with incredible intellect so Theseus/Henry wins this one. In The Cold Light of Day Henry Cavill is a young businessman who flies to Spain for a family holiday on board their boat. He returns to the boat one day and finds his family is gone and will be killed if he does not deliver a missing briefcase. Fights, car chases and action ensues as Henry unwittingly takes on the role of ‘spy’ and battles to save his family. Ladies' man Tommy (Armie Hammer) gets stuck in a malfunctioning elevator in scary thriller Blackout. He rocks some serious neck tattoo and looks like a rock’n’roll, hell raising bad boy in this flick, which is a far cry from any previous boy next door type role he’s played before. It’s a shame he didn’t pull out his real-life guitar skills to woo his women but his luck with the ladies could rival any international super spy, so looks like Armie wins this one. They both started their careers worlds apart, Henry Cavill in a period film alongside Guy Pearce and Richard Harris. Henry Cavill stars as a Viscount Albert Mondego in The Count of Monte Cristo whilst Armie Hammer plays a sports jock in Veronica Mars, which in many American High Schools is actually considered to be a hero. Mondego is a 19th century aristocrat who ends up entwined in revenge plots and duels with sensational sword fights afoot. This may not be a fair fight, as it’s a competition between a classic literary hero and a modern pop-culture one, yet Cavill seems to be winning this one. Even if we are just biased towards his incomparable British charm. From the very beginning of their careers, now to their most recent action outbreak; these two super sleuths come almost neck and neck in the ultimate hero stakes. AND THE WINNER IS... HENRY CAVILL (we may be a bit biased). 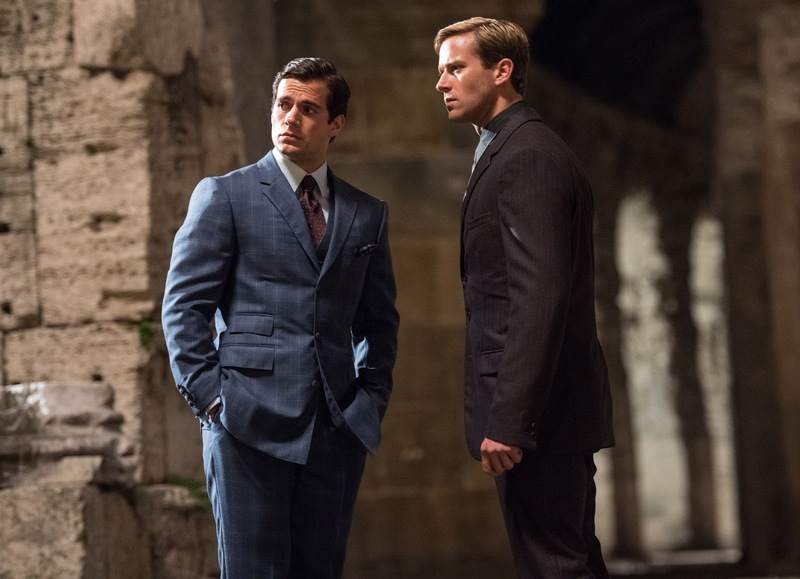 The Man From U.N.C.L.E is now available on digital download , Blu-ray ™ and DVD. Order your copy today. I think it should've been a draw. If it helps, we did consider it.. and then called it for Henry.